The artisans on the tiny Venetian island of Murano have been cooking up timelessly beautiful pieces since the year 1291. Their glass creations are considered the best in the world and while many have tried to emulate their age old recipe, all have failed to capture the true flavor of the Island–– except the master craftsmen of Murano. Which is of course, who created the Murano Fresco Necklaces. Aptly named Fresco (Italian for fresh and new), these necklaces not only honor the authentic Murano glass tradition, they celebrate the skill and creativity of the artisan. Here Murano goes chic and modern in a modified teardrop shape that shimmers with free form shapes and metallic glints. 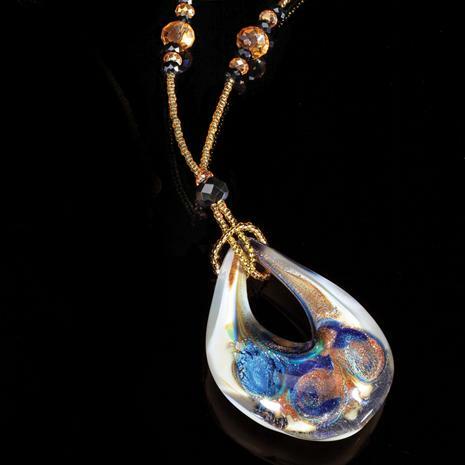 Hanging from a chain comprised entirely of Murano, this is jewelry transcended into art. Pendant is2 1/4" x 1 1/2"